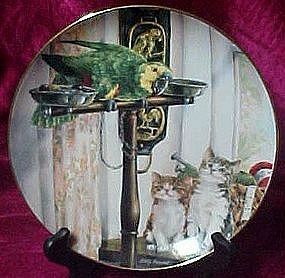 From the Franklin Mint "Polly & Friends" is plate #6 from the series, Whimisical Kittens by Lesley Hammett. A pair of curious little cat's watch the parrot perced above. 1995. Measures 8" diameter with real gold border. Limited edition with certificate, & styro box. Excellent condtion no chips, cracks or repairs.